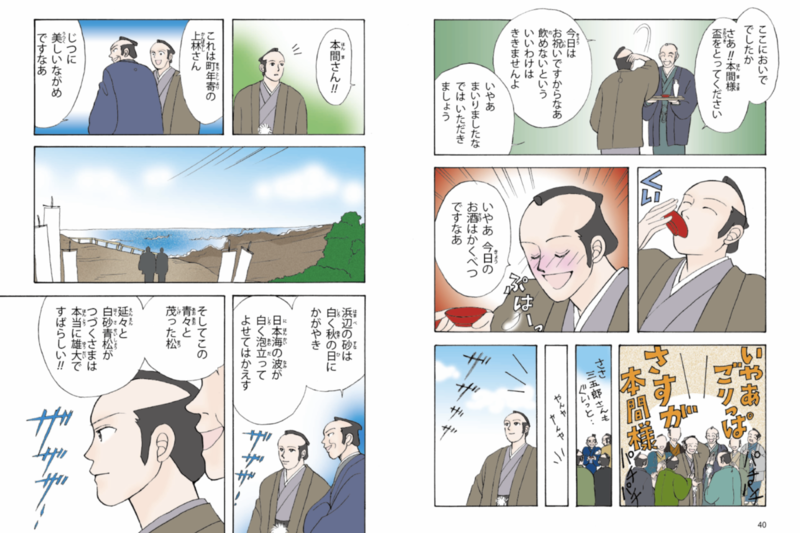 One of Mitsuoka Homma’s greatest achievements: planting pine trees along the coast of Sakata to protect the sea from the sandstorms that were ravaging the area. 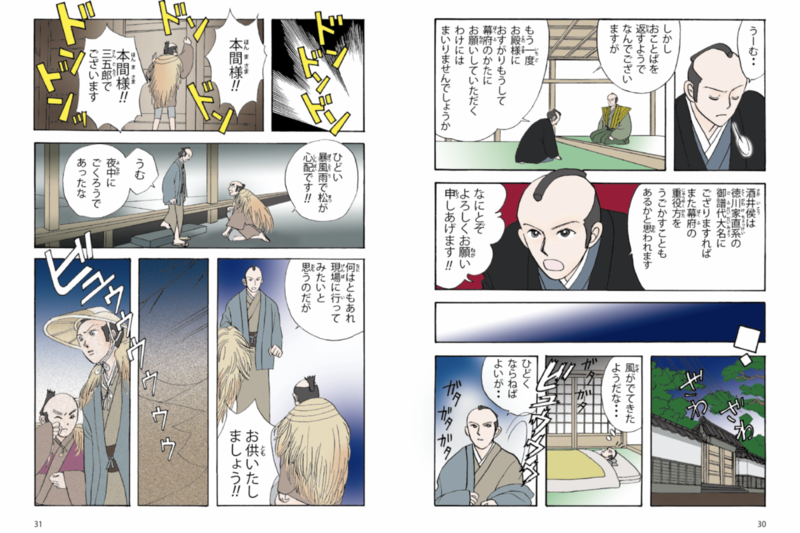 Here is the story, in manga. Sakata, at the time, was facing a huge problem. Every time strong winds hit the coast, they would leave the town and its fields covered in sand. Yet, one thing gave him courage: he’d heard of a place not too far that managed to plant a few trees on the coast. 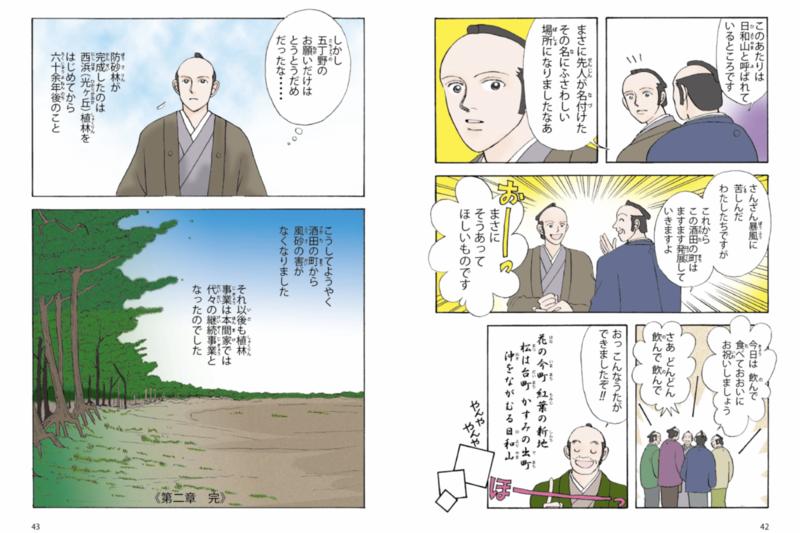 Kyushiro (Mitsuoka) Homma went to the feudal lord with a plan to donate his money to plant trees on the coast of Sakata. His plan was to first plant silk trees in the sand to harden the soil so they could then plant tall pine trees on top. so they hired a lot of people to do the job. At the same time, they ordered 2 million young pine trees that they thought of planting at once, since doing it little by little wouldn’t block the winds at all. Kyushiro asked all villagers to gather any roof tiles they weren’t using. His idea was to gather 5,000 tiles and let them rot so they could be used as fertilizer for the trees. 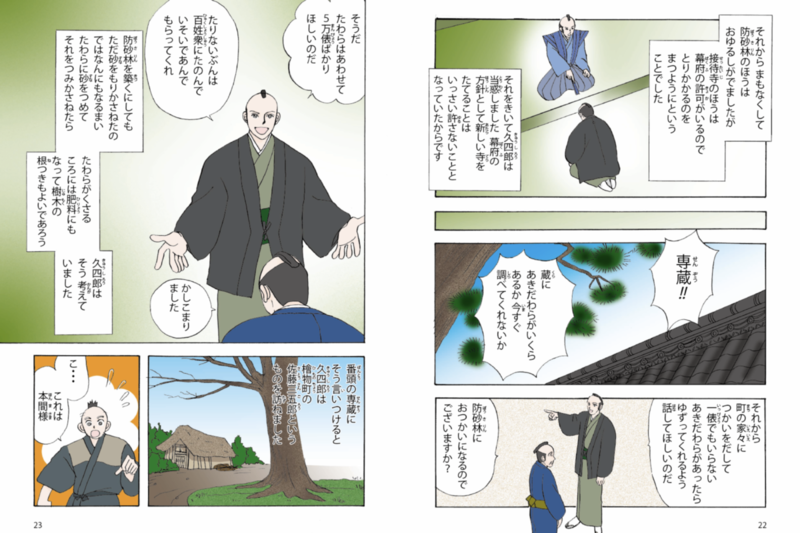 One day, Kyushiro went to a man called Sangoro to seek help. Sangoro was the son of the man who had previously failed at planting trees on the coast. ‘I’m now poor due to my father’s failed attempt, but I would love to help you in any way I can! ‘ replied the young man. When spring came, the project could finally begin. It was a hard task, but with daily effort from everyone, everything started to take shape. 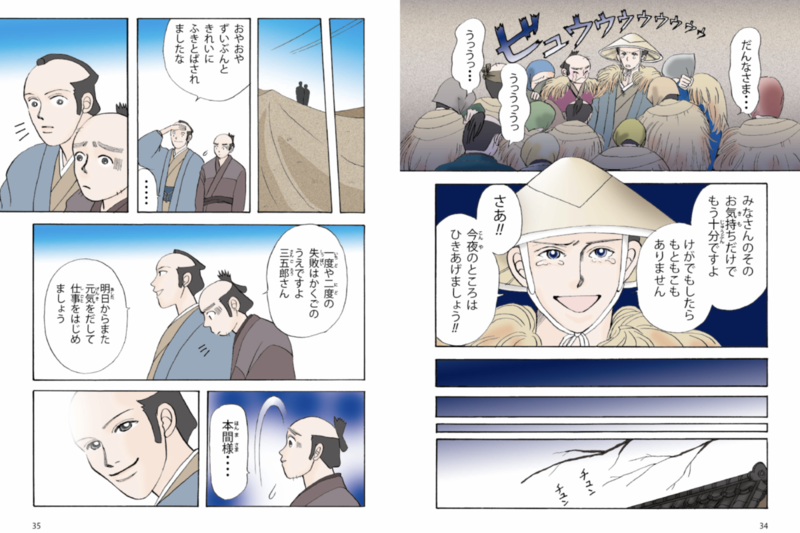 People from the city heard about the project and came to offer their help, which Kyushiro accepted gratefully. 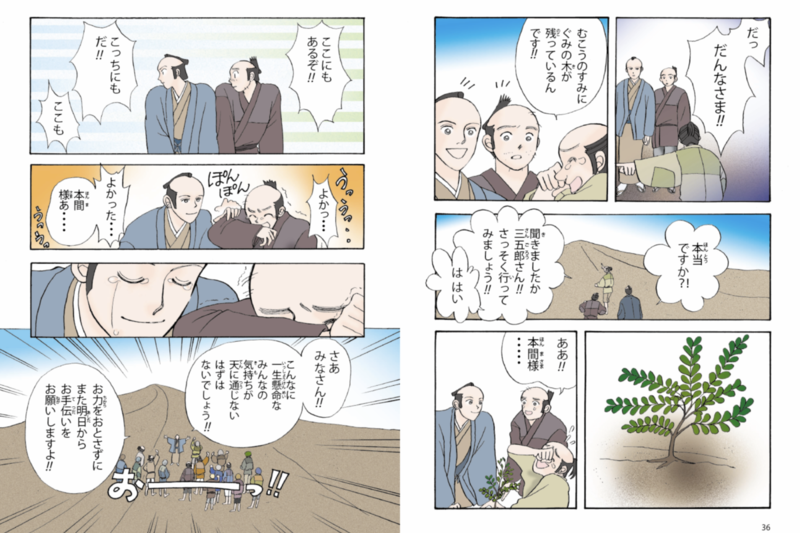 The villagers heard of the news, which gave them the power to keep working hard everyday, planting one tree at a time. 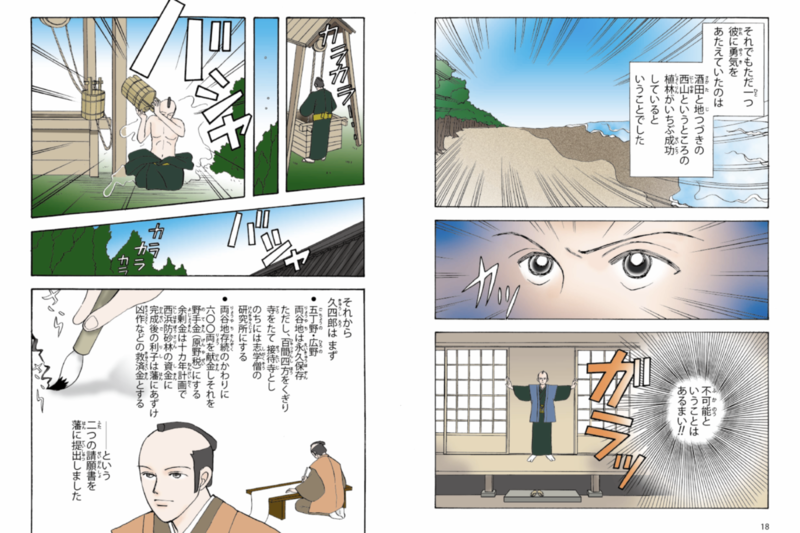 A month later, Kyushiro was told that his other big project of building a temple was refused by the feudal lord. 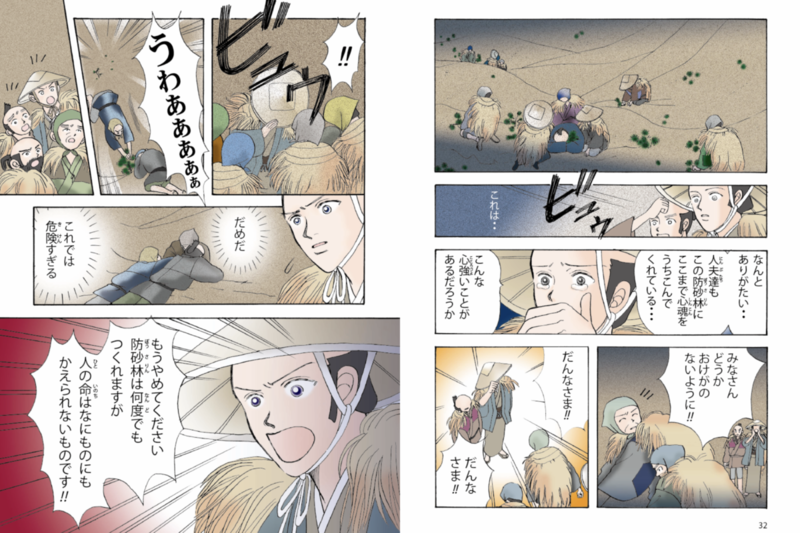 But Kyushiro didn’t want to give up and kept on asking the town magistrate for approval. That night, a rain storm hit Sakata. 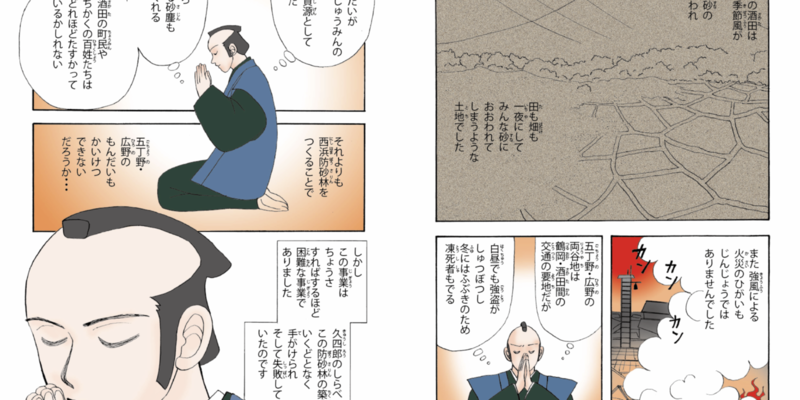 Kyushiro and Sangoro, both very worried, went to the site to check if everything was okay. The villagers, feeling the same, had already gathered there. 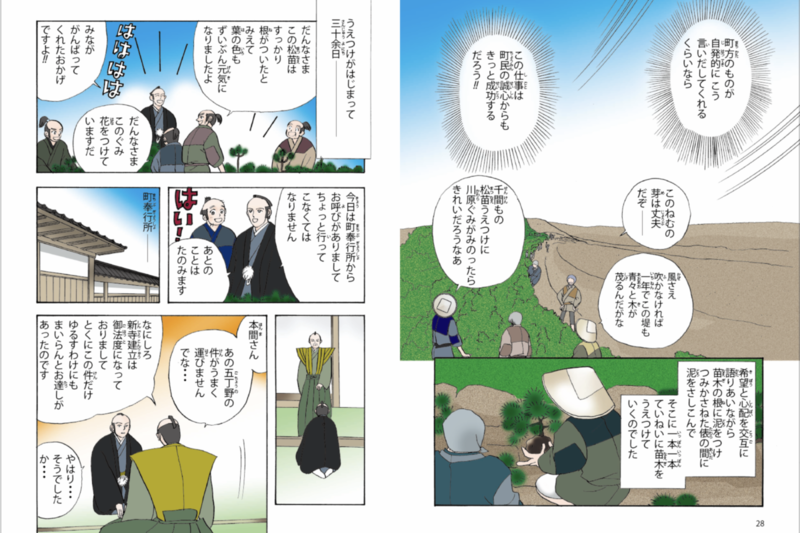 The heavy winds were so strong they could hurt people, so Kyushiro told the villagers to be careful. ‘Your lives are way more important than the trees!’ he yelled. 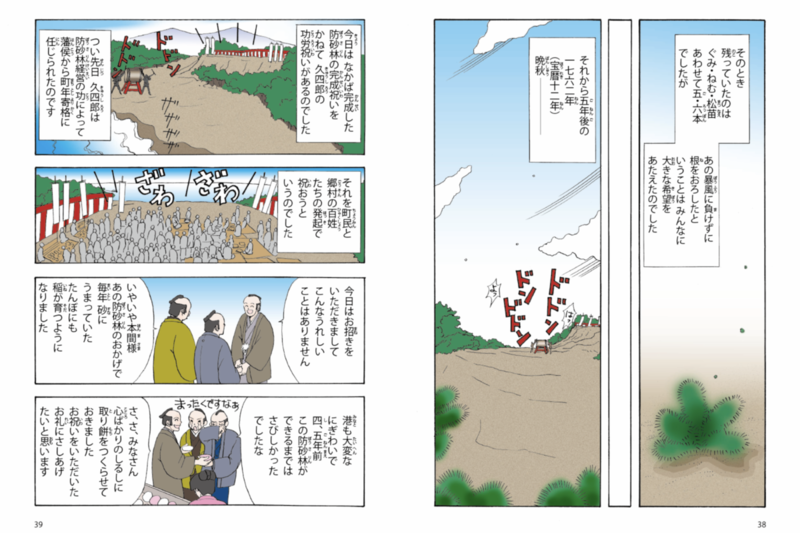 Kyushiro didn’t give up when he saw all the trees gone the next morning. They all went back to work the next day, ready to replant them. As they looked closely, they realised that a few trees had survived the storm. 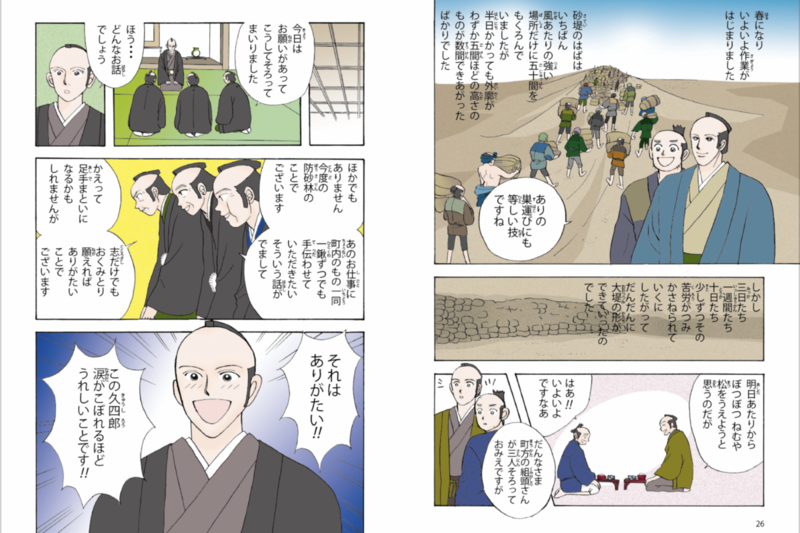 ‘God rewarded you for all your efforts!’ said Kyushiro. Although there were only five or six trees left standing, the fact that they resisted the strong winds gave strong hope to the villagers. So they kept working for five years. 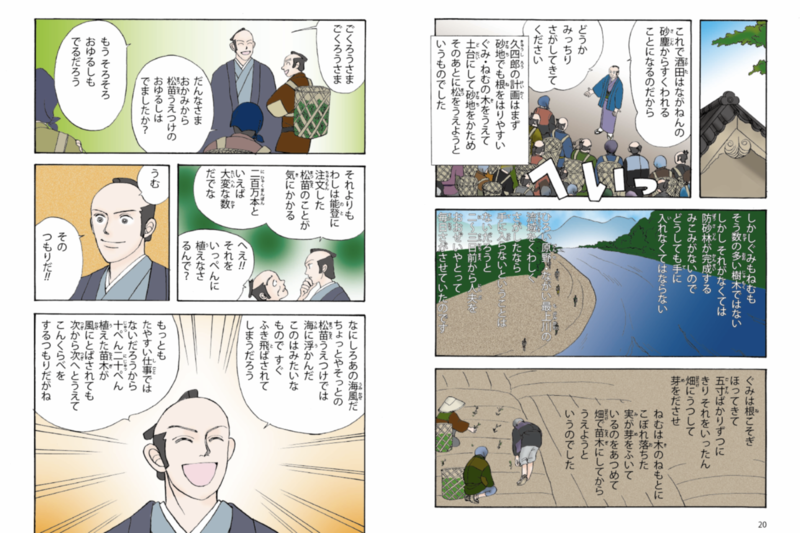 By Autumn 1763, the project was mostly completed, and the townspeople gathered to thank Kyushiro and celebrate his effort. Thanks to the tree planting, rice crops were abundant and more boats were able to come to the harbour. 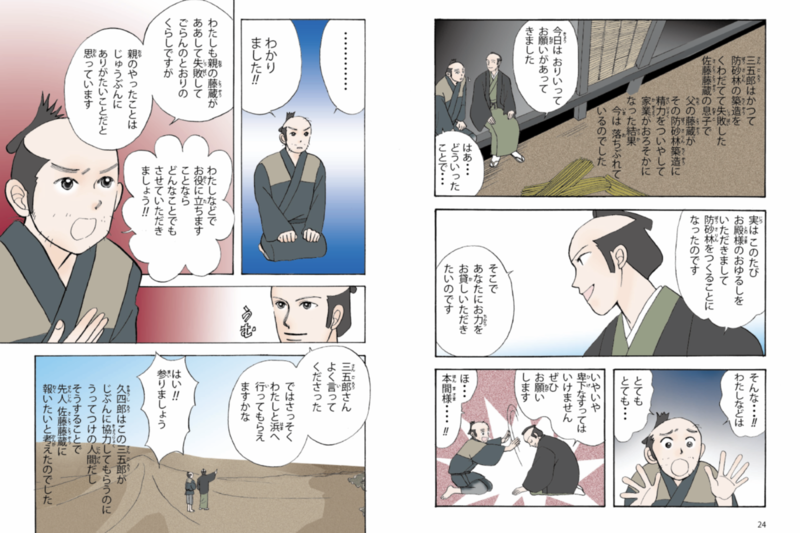 Kyushiro looked emotionally at the sea, thinking of those five years of hard work. They decided to name the place Hiyoriyama, ‘the mountain of favorable weather,’ in memory of all the struggles people had to go through. They kept planting trees, and finished the project eight years after his death. Kyushiro Homma never saw his project of building a temple go through, but people still feel grateful to him for all he did, even after so many years.